FAIRFIELD — It has now happened four weeks in a row. Every week, Lawrence is close to a win against a tough and talented opponent. Every week, the Bulldogs have to settle for the feeling of being close. This week’s scene played out against Brunswick, the team that has a good chance to earn the No. 1 seed in Eastern B. Lawrence hung with the Dragons, but Brunswick had too many backs, and too strong of a pass defense, and earned a 21-7 victory on Friday night at Keyes Field. Brunswick (6-1) was able to throw several different backs at the Bulldogs. Will Bessey rushed 12 times for 101 yards and two touchdowns, and Alex Bandouveres and Ryan Maciejewski each added more than 60 yards on the ground. The Dragons were also coming off their first loss of the season — a 21-14 setback to Messalonskee last week. For Lawrence (2-5), which was knocked out of the playoff race with the loss, the story on offense was the return of Beau Grenier as a ball carrier. Grenier’s hand is still healing, but he led the Bulldogs with 83 yards on 14 attempts, and broke off a 35-yard run. Lawrence came up with a big play early when Dustin Simpson-Bragg intercepted a fourth-down pass in the end zone midway through the first quarter. But after the Bulldogs fumbled the snap on a punt, Brunswick took over on the Lawrence 19-yard line, and Bessey raced for the score on the next play for a 6-0 lead. The Bulldogs retaliated when Brunswick fumbled on a punt attempt, and Lawrence drove 36 yards for a score. Cody Martin hit Seth Powers from 4 yards out, and Chad Martin’s extra point gave Lawrence a 7-6 lead. But just six plays later, Brunswick’s Brady Larson found Cody Buchheit with a 25-yard touchdown pass, and the Dragons led 14-7. Lawrence had other chances. The Bulldogs reached the Brunswick 24 in the final minute of the first half, but Cody Martin’s pass under heavy pressure was intercepted. In the fourth quarter, Lawrence drove from its own 6 to the Brunswick 10, but a penalty set the Bulldogs back. On fourth-and-16 from the 18 with barely two minutes left, Martin was swarmed and managed to throw a prayer, but Taran Payne intercepted for Brunswick. The Dragons also batted away Lawrence’s attempts at the bomb, with both Larson and Maciejewski probably saving touchdowns with deflections. 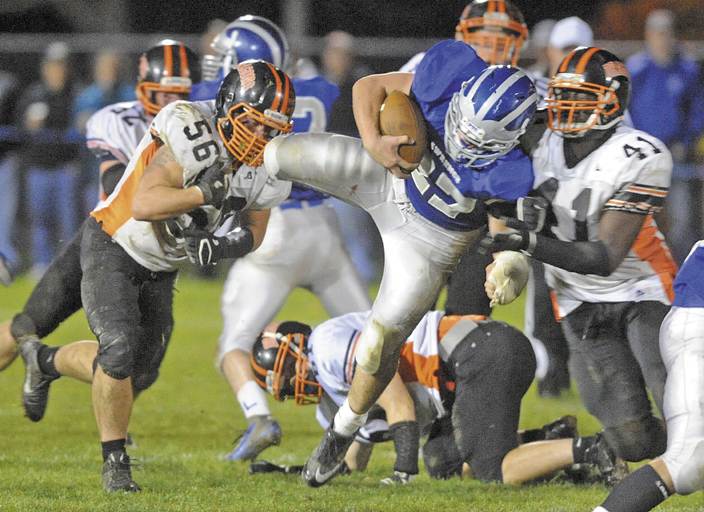 Brunswick added a 4-yard touchdown run by Bessey in the final seconds of the third quarter. Lawrence, which has 10 seniors on its roster, will end the season next Friday night at Messalonskee. It will be the Bulldogs’ fifth straight game against a team with a winning record.